Brian C Mounts: I'm Becoming An Online MBA Student At Ashford University! I'm Becoming An Online MBA Student At Ashford University! I can hardly believe this but after 5 years of school and three years off just to go back and finish my degree I am now going back again a full year later to get a Masters in Business Administration. This will not change my working situation at all and I will actually receive financial assistance from my employer to pay for the degree so it should be great for me in the long run. This will be a 16 month program with 100% of the classes taken online. This is of course what makes this program feasible for me as I can't very well quit my job. 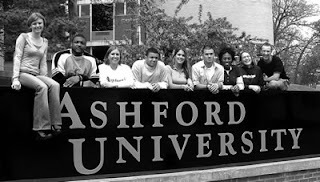 I'll be starting the online MBA program at Ashford University on January 8, 2008 and will be anticipating graduating in April or May of 2009. Wish me good luck! This means that I will have a graduate degree for at least two years before Flor gets one. That will make me feel good. :) Of course she is going to be a doctor and I'll continue as a banker so I guess she'll eventually be far more impressive than me anyway. Well, that's all I have to say for now. Expect more pictures from me in the future as the holiday's are coming up I will have to start capturing moments again.